This young lady enjoyed a self esteem boost when she got her braces were removed. Adult cosmetic orthodontics improves your smile and self confidence. Our braces are for limited cosmetic cases, not for bite correction. We offer this service to adults only. Not for children or young adults who are still growing. 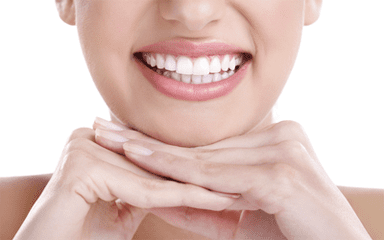 The average case time is 6-9 months and we offer metal or ceramic brackets. Brackets are bonded onto the front of the tooth surface by using a dental bonding agent. An arch wire is placed in the bracket which guides the teeth to the correct position. During this phase, you have monthly adjustments. After treatment, retainers are worn to maintain the position of your teeth. This gives the bone and gums more time to stabilize around the teeth. CALL OUR OFFICE TO SET UP A FREE ORTHO CONSULTATION!